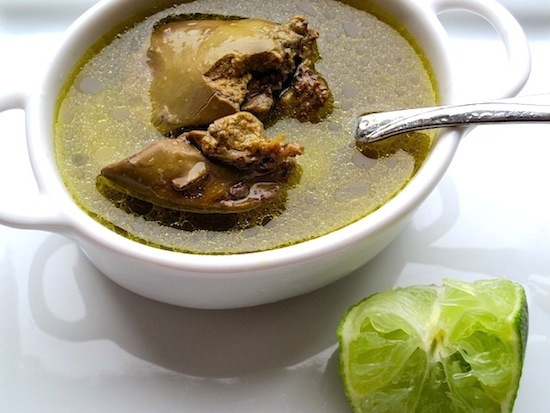 Consome de Pollo is a traditional Colombian soup made by cooking chicken parts like the liver, wings, heart, and legs, along with vegetables. Once strained, it is served in a small cup, as a clear soup, with pieces of liver and heart. I have to tell you, this soup is delicious. You don’t have to eat all of the chicken parts, just discard them, but if you like chicken liver, at least leave those in the soup. The flavor is wonderful. Place the chicken parts in a large container with ice water and soak them for about 1 hour. This will help to clean up the blood and bad stuff from the chicken parts. Remove the chicken parts from the ice water and discard the water. Place the chicken in a large pot and add the water. Bring to a boil, skimming off any foam from the top. Reduce the heat to low and add all the remaining ingredients. Cover and simmer for about 4 hours. Remove from the heat and remove the chicken parts that you want to eat and set them aside. Strain the broth through a fine sieve & return to the broth the chicken parts that you would like to eat. Serve the soup hot in small cups with lime juice. 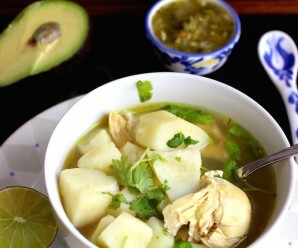 Note: This can be use as chicken broth to make other dishes and it can be stored in the refrigerator for up to 3 days or freeze up to 6 months, so make a big batch. I thought that was liver! Oh, a soup that is calling my name!! 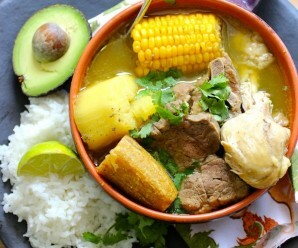 ¡Delicioso! Erica, y mira que entona bien el cuerpo en estos días fresquitos que nos llegan. Are you kidding. I love chicken livers!! This soup is really good. MMMMMMMMMMMMM,..the chicken consommé looks stunning & ooh so rich too! I am at work right now hanging by a thread as I was at a wedding yesterday and had a bit much to drink. This soup is a sure cure for my ailment. Mandame un poquito…please! Hello Erica, long time no see! I’ve been very busy but I now want to catch up with all my foodie friends. This soup is new to me. 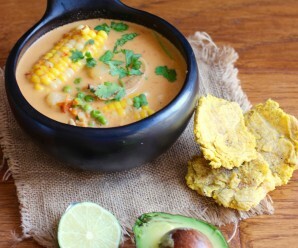 In Mexico we eat consome with a lot of vegetables and sometimes rice. The liver and heart of the chicken sound delicious for a winter night, hehe. Ummm, the broth sounds great- I ate gizzards as a young girl, and they do make a good broth and dressing at Thanksgiving! I woke up terribly sick today. 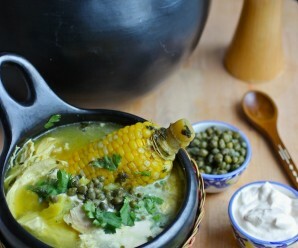 This consome is a miracle cure for flu and colds. Plus it’s delicious and easy on the stomach. I love it!